Joseph H. Peterson, © 1995, 2003. If we examine H. P. Lovecraft's use of the name "Azathoth", I believe we can shed some light on his probable source of information on the Necronomicon, namely John Dee's partial English translation. American author Howard P. Lovecraft was known for featuring sinister ancient texts in his horror fiction. His biographers have documented some of his texts as genuine, such as Borelli's De Motu Animalium and Johann Trithemius' Polygraphia, (Oppenheim, 1518). Lovecraft apparently was familiar with some of the texts only through secondary sources. Such is thought to be the case with Raufft's De Masticatione mortuorum in tumulis which Lovecraft almost certainly learned about through Calmet's Dissertation upon the Apparitions of Angels, Daemons, and Ghosts, ... (London, 1759).1 Still other texts mentioned in his stories are generally regarded as Lovecraft's own inventions. Many of his stories draw on a common 'mythos' which he associated with the prototypical evil book, the Necronomicon. However, it is not entirely clear whether he was drawing on original source material, secondary sources, or his own imagination for this mythos. 1. See William Scott Home, 'The Lovecraft "Books": Some Addenda and Corrigenda' in The Dark Brotherhood and other pieces (Sauk City, Wisconsin, Arkham House, 1966, pp. 134-152). Calmet's book has recently been republished in abridged form as The Phantom World (Wordsworth Editions Ltd., 2001). I believe one key to understanding Lovecraft's Necronomicon mythos can be found in his 'History of the Necronomicon,' where he states that "a translation made by Dr. Dee was never printed. "2 2. August Derleth, Dark Brotherhood, p. 263. John Dee (1527-1608), perhaps best known as Queen Elizabeth I's scientific advisor, left an enormous literary output, much of which was never meant to be published.3 Dee assembled one of the most impressive libraries of his time, many of his volumes being rescued from then-recently-defunct Catholic monasteries. Even in his own time Dee had a reputation for being involved with sinister magical practices. Indeed much of his library was kept secret and separate from his public library because it was dangerous to possess such texts. Fortunately, many of the original volumes from Dee's bibliotheca externa, as well as his secret occult library, have been identified through the meticulous research of Julian Roberts and Andrew Watson.4 This was largely possible because Dee usually left copious notes in the margins of his books, including some very characteristic symbols.5 3. William H. Sherman, John Dee, The Politics of Reading and Writing in the English Renaissance (Univ. of Massachusetts Press, 1997, pp. 116-117). 4. Julian Roberts and Andrew Watson, John Dee's Library Catalogue (Oxford, 1992). 5. For example, a bracket shaped like a face used to indicate alchemical passages. Dee also used a symbol described by Sherman as his 'ladder symbol'; this is seen in the margins of a 13th century manuscript of Liber Iuratus (Sloane Mss. 313) which identifies it as coming from Dee's secret library. 6. C. H. Josten, A Translation of John Dee's "Monas Hieroglyphica", Ambix, Vol. XII, 1964, p. 100-101. 7. Dee's preface to his Monas Hieroglyphica, in Josten op. cit., p. 165. It is hard to imagine that Dee regarded ars necronomica any less dangerous than ars pyronomica. Edward Kelley's scribblings in Dee's manuscript. 8. On Dee's "Arabik boke", see Peterson, John Dee's Five Books of Mysteries (Red Wheel/Weiser, 2003, p. 15, 40, 353). It was prized by Pontois and described as having "cost Doctor Dye £ 600 ready money as he the deponent did hear himself the said doctor afferm." It somehow disappeared in 1583, and Dee asked the spirits for help in recovering it. It was eventually recovered in 1595 "by gods favor." 9. Peterson, op. cit., p. 356. It is also possible of course that Dee wrote the text much earlier, and Kelley only picked a convenient blank spot between chapters to write. 10. It is also damaged in many places due to careless handling by successive owners, including a maid who used pages under pies and tore out strips to light fires and such. We know this because of the account of how Ashmole came to possess Dee's stash of private occult writings, which is bound with Sloane Mss 3188 in the British Library. 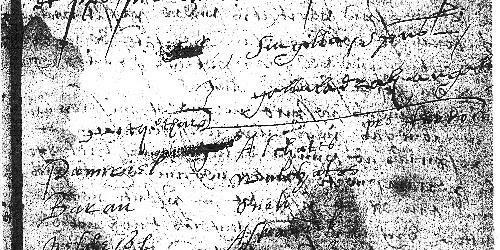 It is this incomplete and fragmentary nature of Dee's manuscript which gives us a clue to Lovecraft's sources. While HPL consistently uses "Azathoth" to refer to a demon of chaos, a comparison of the fuller Latin text of the Necronomicon with Dee's manuscript shows that there are actually two separate beings with similar-sounding names ("Az" and "Aza-Thoth"). This is not at all apparent from the Dee manuscript alone. 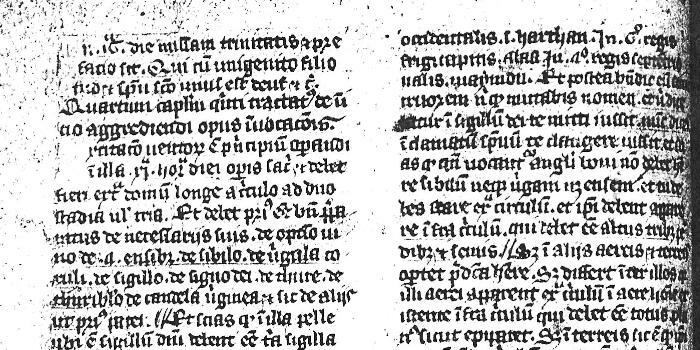 Latin manuscript of Necronomicon, ca. late 14th or early 15th century. "The blind demon Az sits on the throne of Chaos. It is he who swallows everything, and when in the end he finds the world is nought, he eats himself. "And, afterwards, when the twelfth millennium comes, through Hucedar-mah the creatures become more progressive, and he utterly destroys Aza-Citra." This also may provide a clue as to the meaning of his name, since *Aza-Chithra can be translated 'Spawn of Az', if we assume Middle Persian loan words in Alhazred's (lost) Arabic original. I believe this is strong evidence that HPL did not have access to the fuller text as preserved in the Latin edition, and most likely had only seen Dee's manuscript.